Setting up the new Mac Pro and creating a good stress test session, was a bit more work than anticipated. That’s why it hasn’t exactly been the new Mac Pro Week yet. This is because together with the preperations for the new Mac Pro, I also took the opportunity to rearrange some of the equipment and cabling in the studio. I wanted to do this for a long time but just didn’t get around to it. And programming the Universal Binary version of Mix Buddy can’t be interrupted either of course 😉 So, I finally have the new Mac Pro set up installed and ready for some heavy testing. Before I could test the new Mac Pro though, I first had to create a demanding session and put the old Mac Pro to the test for comparison. A test like this requires a session that pushes the CPU in the old Mac Pro to its limits with some heavy plug-in processing. That session could then be used on the new Mac Pro to see the difference in performance and power. The main DAW that I use daily is Pro Tools HD. Obviously that was the DAW in which I would create the test session. But then it dawed – eh, dawned on me – that I had a great opportunity to do the exact same test with Logic Pro X. After all, its latest version has been updated recently by Apple to harness the full power of the new Mac Pro. It would be great to see how big the performance advantage is by comparing the session on Apple’s latest power machine. 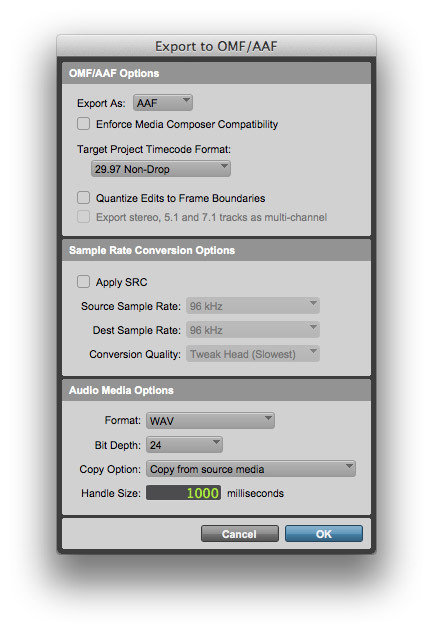 Another bonus is that I would be able to compare the performance of the two DAWs. I absolutely do not want to start another Logic vs Pro Tools debate. I’m just intrigued to find out which developer makes best use of the computer’s resources. Apple has the advantage of creating the software for their own hardware. But to be honest I don’t believe the performances will differ all that much. We are soon going to find out. It’s hardly exact science but to get interesting results the test sessions should be as identical as possible in both DAWs. This means I can’t use any of the plug-ins that come standard with Pro Tools and Logic, as they make use of totally different code and algorithms. 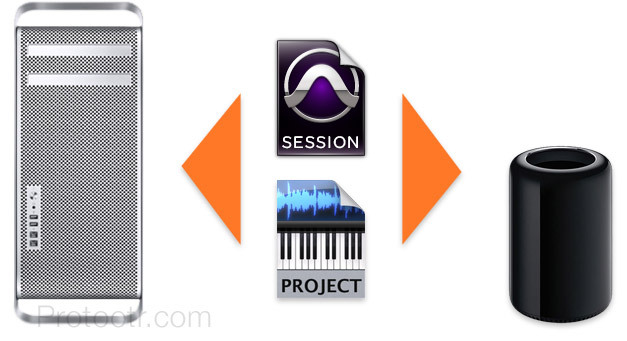 The sessions can therefore only use third party plug-ins. 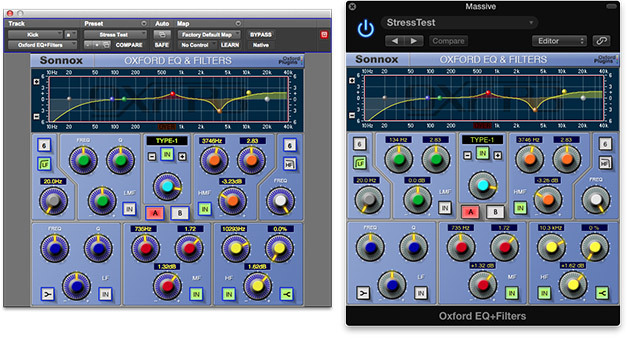 These use the same processing algorithms for AAX and AU to avoid sound differences. The plug-ins also have to be available in 64-bit for both formats. AU’s won’t be a problem because Logic has been supporting 64-bit for a while now and most plug-in developers have created 64-bit AU versions. AAX though is relatively new and still catching up. But with new 64-bit AAX plug-ins announced every week, Pro Tools is well on its way to soon have its full armour of third party plug-ins back. Basically, I have to find plug-ins within my collection that conform to these specs. The test session in Pro Tools uses 96 kHz and 24-bit audio. This sample rate and bit depth reduces the number of tracks I have to make to push the processor. 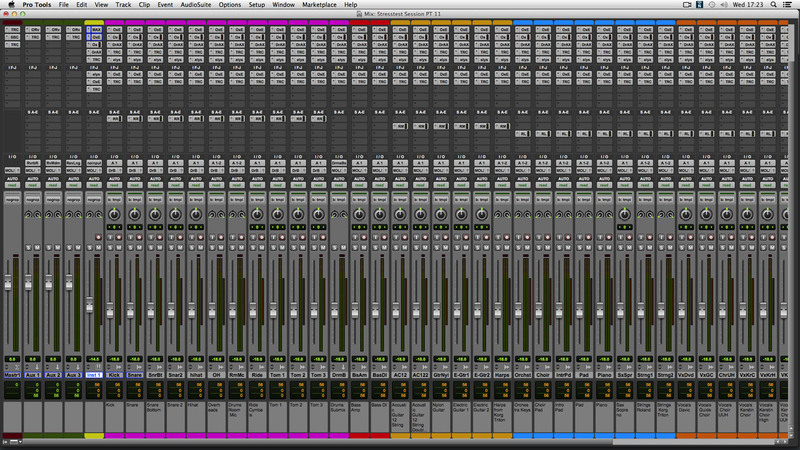 The session ends up having 41 audio tracks, each with volume automation and 7 plug-ins inserted. The seven plug-ins comprise of two instances of Sonnox Oxford EQ, one instance of Sonnox Oxford Dynamics, one Native Instruments’ Driver saturation and distortion plug-in, IK Multimedia’s T-Racks Classical EQ, one T-Racks De-Esser, and one instance of Elysia’s Niveau Filter. It’s not a processing chain you would use in real-life that quickly but as said, I want to kick the CPU’s behind. There is one instrument track with Native Instruments’ Massive synthesiser running a demanding preset. 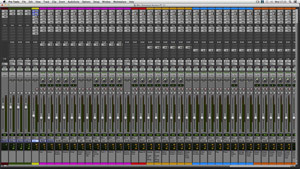 After Massive the exact same seven processing plug-ins as on the audio tracks are inserted. Three Auxiliary tracks each contain Sonnox Oxford’s high quality reverb plug-in followed by IK Multimedia’s T-Racks Linear Phase EQ plug-in with the linear phase function turned on. Finally the Master track has three plug-ins inserted. T-Racks Linear Phase EQ, again with the linear phase function on. This is followed by Native Instrument’s Solid Bus Compressor and a copy of T-Racks Brick Wall limiter. The number of plug-ins totals to well over 300. The session is not about how it sounds but how well the DAWs perform. Now I have to recreate the exact same session in Logic. This of course gets the same sample-rate and bit depth plus each and every plug-in with the exact same settings or preset. Not really thinking ahead, I used some of my custom plug-in presets in Pro Tools. Unfortunately you can’t open an AAX plug-in settings file in an AU plug-in and vice versa. While recreating the plug-in settings in Logic by hand, from screenshots of the Pro Tools plug-ins, I soon realised how tedious that was so I changed over to presets for the rest of the plug-ins and also changed them in the original Pro Tools session. 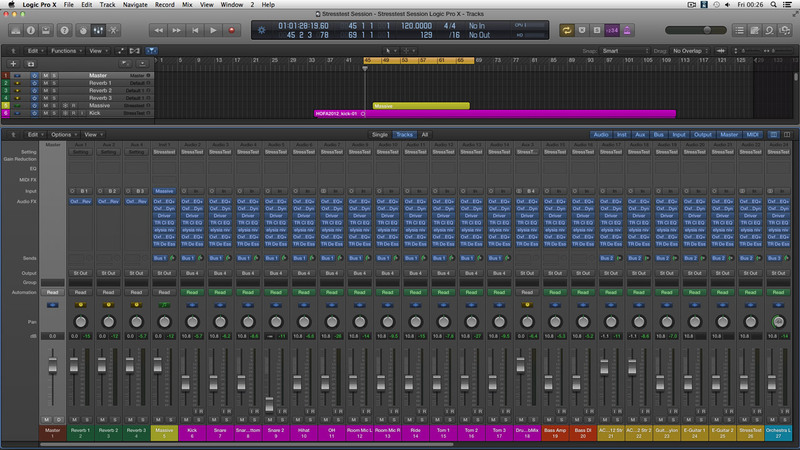 I only had to do like 15 plug-ins, as I would duplicate the 7 plug-ins on an audio track via Logic’s track settings. Still, using presets was much quicker. To get the audio and midi from Pro Tools into a Logic project, I exported an AAX and a midi file. Importing the midi file gave no problems but the AAX file did. All the stereo interleaved audio tracks were imported as multi-mono files. This was resolved by joining the audio files on the left track and deleting the second track. The AAF export window has the ‘Copy Option’ set to ‘Copy from source media’. You would expect that the interleaved audio files in Pro Tools would then be copied correctly to the AAF file. But they weren’t. 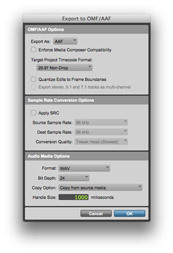 Other options like the ‘Export stereo, 5.1 and 7.1 files as multichannel’ need the ‘Enforce Media Composer compatibility’ check box to be turned on. This in itself induces some other incompatibility problems with Logic. The whole AAF export from Pro Tools to Logic workflow (and back) is food for another post. All channels in Logic’s Mixer Window didn’t have the same names as the tracks in the Arrange window. 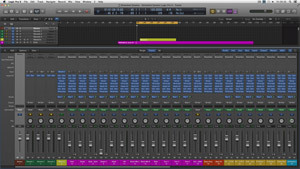 The ones in Logic’s Arrange window neatly reflected the names of the tracks in Pro Tools but the Mixer window received default names like Audio 1, Audio 2 et cetera. Setting the ‘Channel Name Column’ setting in Logic to ‘Automatic’ solved this. Another thing that popped up was with automation. The volume automation in Pro Tools was drawn across all entire tracks using the pencil tool. In Logic the automation was only retained on the spots where there was an audio clip. This would impose a problem when you for instance have an inline reverb or delay plug-in that you want to hear fading away after the clip ends. For the test session I resolved it by copying the full length automation from another track. Finally I had sessions in Pro Tools and Logic with identical tracks, settings, automation and even color coding. It was time to test the playback of the session. The session in Pro Tools was of course created to push the old Mac Pro to the limits of what it can do. In my next post I will show you how Pro Tools performed on the old and the new Mac Pro. It will include all specifications and details of the machines. After that I will dedicate another post to show you how Logic fared.